The economic evolution of Europe requires an on-going adaptation of trading behaviour and in particular of the Rules and Practices of the potato sector. The first European rules were established, as early as 1956. 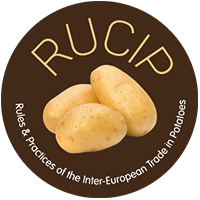 Through the efforts of the European Union for the Wholesale Trade in Potatoes – now EUROPATAT – professional practices were defined and a simple and efficient procedure for expert assessments and arbitration, known ever since by RUCIP, has been set up. The formation in 1964 of the RUCIP EUROPEAN COMMITTEE, made up by EUROPATAT and the Co-operatives of the European Confederation of Agriculture (C.E.A. ), whose representative responsibilities had been taken over by INTERCOOP EUROPE, provided the justification for a new edition of RUCIP.